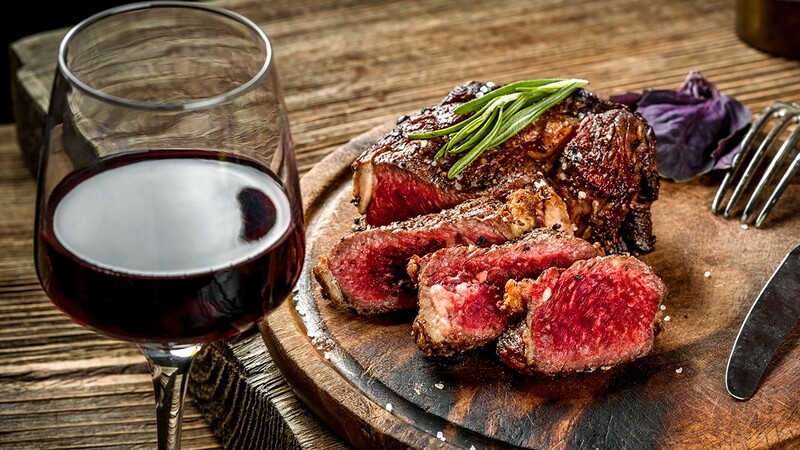 There are plenty of reasons why red wine pairs so well with a delicious steak. Some are cultural, some are even scientific, but for most people, the perfection of this pairing comes down to the magic it performs on our palate. I love pairing wine with steak. And, honestly, nothing brings out the beefy characteristics of our grass-fed steaks like a heady red wine. When trying to decide how to pair your booze with your dinner, you should start with the cut of meat. Braised roasts and ribeyes have richer, fattier flavors and need a deep, full-bodied wine to hold up. These pair best with a cabernet or Zinfandel for example. For leaner cuts like sirloin steaks and round roasts a mellower wine like pinot noir or merlot work nicely. You can get even better pairings by matching characteristics of your seasonings and sauces with notes that the wines exhibit. For example, mushrooms and onions pair well with wines with spicier characteristics; sweeter sides dishes taste best with fruitier wines. A vital step to pair wines and beef is to make sure you put some thought into how you plan to use the two together. What I mean is that you should keep both the meat and wine in mind as you plan your meal. You may have a dish you want to try cooking or a wine you’ve discovered that you’re itching to drink. Don’t just cook the dish without thinking of the wine or pick a wine without thinking about how it pairs. You need to balance the other half based on the choice you make with the other. If you began with wine, choose a dish that has a complimentary flavor profile. If you choose to begin with a dish, find a wine that will add to the experience. Cooking with wine has a few different rules, but the main key is to only cook with a wine you would enjoy drinking. There are plenty of delicious, affordable wines, so choose one that you like. You don’t want to use a $50 bottle of cabernet sauvignon as the base of a rosemary and red wine sauce for a filet, no matter how expensive the cut. I highly recommend a book called Culinary Artistry for a detailed break down on flavor combinations. In my early days of menu creations, this book was my bible. I recently put together a 10-course wine dinner with a focus on Burgundy. I began my recipe creation process by exploring all the different notes Burgundy wines exhibit — flavors like vanilla, cocoa, and pepper, as well as coffee and various berries. I then picked proteins like salmon and oysters, and hearty steaks like ribeyes and chuck steaks to balance the astringency or acidity of those tastes. I also flavored the meat with rubs and sauces that incorporated notes from the various wines. This way, each bite complements each sip and vice versa. One thing to note, you are not always going to find a perfect match between your protein and your win. That’s fine! As you experiment more and more, you will notice what works and what doesn’t. Your palate becomes more discerning, alerting you to imbalances when some taste is not quite right. Just remember, the number one rule for pairing your wine and meat is to make sure one flavor doesn’t overwhelm the other. Balance is the key to successful wine and food pairings. The true joy of the pairing comes when you take that bite of steak, and wash it down with a sip of wine, and you know immediately: You nailed it. There is no sensation quite like a pairing working in perfect harmony in your mouth. This post first appeared on the ButcherBox blog, Roam. If you want some of the delicious, healthy meat mentioned in this post, subscribe byclicking here or on the banner above. If you like this post, give us some 👏 below. 100% Grass-fed and grass-finished Beef, Free Range Organic Chicken, & Heritage Breed Pork delivered to you. Authentic stories from the frontline of grass-fed. Authentic stories of healthy food, better living, wellness, and more.